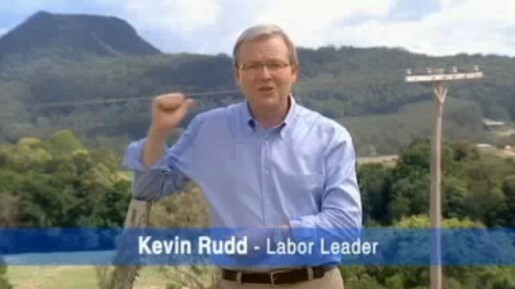 Kevin Rudd in October 2007 outlined the Labor vision for Australia’s future. Heading into 2008 Australia is now in ‘taste and see’ mode. At some point the country will need to move into ‘make it happen’ mode. This year I’ve been talking to people all over Australia, including back here in this part of country Queensland where I grew up. This is a great country, and what struck me is there’s so much we all have in common. We want the best for our families, for our kids to one day afford their own home, for every young person to get a first-class education, a decent hospital system, and a workplace that’s fair and balanced. This election is about the future, and it’s our common goals that have helped shape my future plans. For an education revolution, including pre-schools, trades, as well as universities. Real action now on climate change. A national plan to fix our hospitals, by ending buck-passing between Canberra and the states. And a workplace that’s fair and balanced. An economy that’s strong, but one that also delivers for Australian working families. It’s our common goals that have made our country great in the past and, if we stick with them, they’ll keep Australia great into the future.